The Native American Cherokee Indians really know how to make the best tobacco products! That’s why Cherokee Pipe Tobacco continues this age-old tradition with each of their high-quality tobacco offerings. After all, Native American Cherokee Indians have been smoking and producing tobacco a lot longer than any regular pipe tobacco company so you know this product is above average. Cherokee Pipe Tobacco features long ribbon cut tobacco that’s made in a classic manner that uses flue-cured and burley leaf. The result is a distinctive tobacco that tastes good and smokes good. 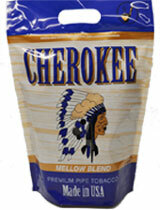 If you love medium to strong tobacco, then you’ll love all of Cherokee Pipe Tobacco’s offerings. There are five different blends to entice your taste buds. The Original blend has a more robust taste than the rest of the blends. Ultra Silver is smooth and sensual from start to finish. The Mellow blend is easy and goes down smoother than Ultra Silver. 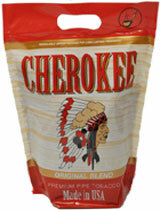 If you want an exotic taste, then go with Cherokee Pipe Tobacco’s Turkish blend! Finally, there’s Cherokee Pipe Tobacco Menthol, which has a slight minty taste that won’t overpower the blend’s original flavors; it only enhances them for added enjoyment!